Did you know that it is possible to save up to 40% in taxes upon selling your real estate asset? Educated real estate investors across the US are utilizing the 1031 exchange as a part of their investment strategy. This enables the selling of a property and deferring the capital gains taxes from the profit by reinvesting in a like-kind asset. The IRS recognizes that selling one property and replacing it with another investment property will allow for the deferral of taxes indefinitely – as long as the capital is reinvested in real estate that is not considered as your place of residence. The usage of the 1031 exchange clause will not only save you on those federal capital gains liabilities but also on the following: depreciation recapture tax, the Affordable Care Act Surtax, and state capital gains tax. These taxes can accumulate to well over 40%, and the deferral of such taxes is a tremendous investment bonus. The bottom line is that a 1031 exchange enables tax deferral, a greater yearly cash flow, and a higher capacity for wealth creation. So, how does the 1031 exchange come into play? Let's see how much Sean and Lisa would owe on taxes following the sale with realized gains of $1,440,000, which is in the high tax bracket in the State of California. With a 1031 exchange, 37.3% taxes can be deferred, saving Sean and Lisa a whopping $535,340. 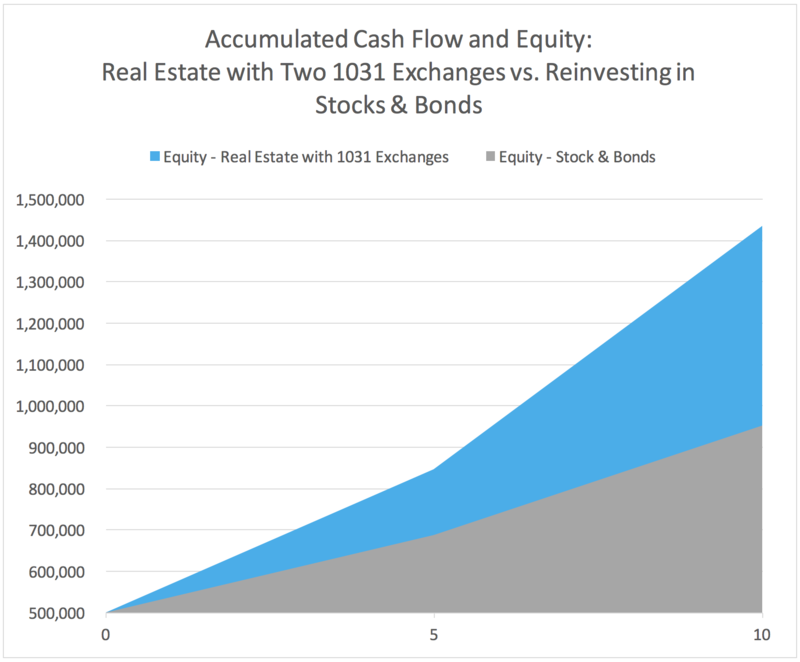 How Does the 1031 Exchange Support a Higher Cash Flow and Wealth Creation? Sean and Lisa could either put their money back into real estate as part of an immediate 1031 exchange with a 50% mortgage or opt for stocks and bonds. If each investment produces a 6% annual cash yield, what will be the outcome? An annual gain of over 40% is due to the 1031 exchange. Sean and Lisa are on their way to real wealth creation by investing back into real estate. The graph below illustrates how using 1031 exchanges can create wealth. It compares the cumulative cash flow and equity build up Sean and Lisa would receive by utilizing 1031 exchanges with the cumulative cash flow and equity build up they would receive if they reinvest the proceeds from the sale of their property in stocks and bonds instead*. While the benefits of 1031 exchanges are clear, the process of doing a 1031 exchange is complex and involves several hurdles. These include identifying and purchasing the right replacement property (or properties) within the time frame allotted by the IRS. Fortunately, you don’t have to go it alone. iintoo, an online real estate management company, helps investors who are interested in 1031 exchanges overcome some of the major hurdles involved in the process. iintoo offers ownership shares in a wide range of properties that have passed its rigorous due diligence and approval process to investors who seek above-average returns, a steady passive income stream, and no landlord duties. To maximize potential returns and mitigate risks for investors, iintoo negotiates favorable deal terms with, and receives personal guarantees from, reputable real estate companies. iintoo also offers complete project oversight throughout the investment life cycle, including progress reports and the handling of quarterly returns. On iintoo’s secure digital platform, 1031 Exchange investors can choose your replacement property or properties, invest, receive regular updates on the status of your investment and connect with like-minded investors as well as with iintoo's team of real estate experts. Register today to find out how iintoo can help you reap the rewards of a 1031 exchange. * Basic assumptions: $500,000 beginning equity; 6.0% initial cash-on-cash return. Real Estate: 3.5% capital appreciation and NOI growth rate; 50% LTV mortgage, 5.0% interest rate, 30-year amortization; 80% of basis is depreciable, 27.5-year straight line depreciation, 5 years between trades; 1.0% of purchase price transaction costs per trade. Tax rates: Federal Capital Gains 20% (as of Realized Gains minus Depreciation taken), Tax on Depreciation Recapture 25%, Affordable Care Act Surtax 3.8% (as of Realized Gains) and California State Capital Gains Tax 12.3% (as of Realized Gains). Stocks & Bonds: 3.5% annual growth in cash flow. No reinvestment of cash flow in either option. ** Neither iintoo, iintoo GP LLC, nor Dalmore Group LLC give tax or legal advice, therefore you should review any planned financial transactions that may have tax or legal implications with your personal tax or legal representatives or advisors.